A few weeks ago I started wearing my good old wristwatch again. It’s a cheap analog metal watch, but with a sapphire screen, which appears to be all the rage these days. Plain old wristwatch – great at telling the time. There is one thing that watches do incredibly well: tell the time. I can always tell the time at a glance – without touching my wrist – and I virtually never have to worry about the battery running out or my watch failing me otherwise. If Apple’s rumored upcoming wearable is a watch (and this is not entirely certain), it must not be worse at fulfilling that primary purpose than any other simple watch, mine included. The smart watches currently on the market are crippled by their humongous size and embarrassing battery life, mostly because of their big displays. LCD displays make for great multimedia experiences, but a very bad watch experience. Traditional watches have none of these problems. Their digits are always visible and the battery lasts for years. I propose that a great smart watch (with the current technical constraints, at least) should not have a screen as it’s primary interface. 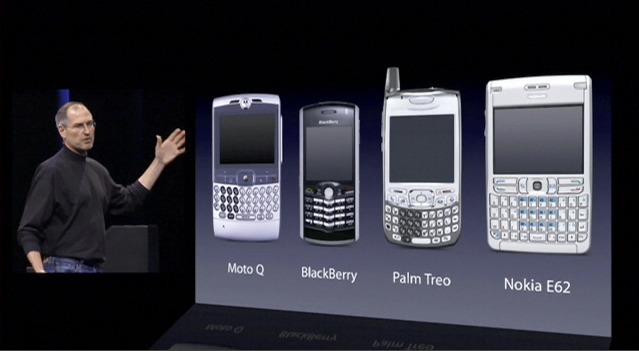 This looks a lot like the slide of 2007 "smart phones" that Steve Jobs showed at the introduction of the original iPhone (via smartwatchnews.org). So, how would one go about making a normal wristwatch “smart”? If a watch is all about telling the time, then that aspect should first and foremost be enhanced. Most often when I look at my watch, I need to know the time because of some context. For example, I might have an upcoming appointment that I don’t want to be late for. An augmented watch should sync my calendar events from my iPhone via bluetooth (which uses very little power and component space) and show me when my next appointment will be in relation to the current time. But how would this theoretical watch display such information? The answer can, I believe, be found in – of all things – car dashboards. The dashboard of a 2011 BMW 550i. Premium car dashboards are awesomely designed analog interfaces – and many get by with nary a display.1 They use back lit cutouts of meaningful symbols to signal state to the driver – without distracting or presenting superfluous interactivity. That is how a smart watch should work. A rough draft of how I would imagine an Apple smart watch to look. It has been questioned whether Apple, a tech company, could design a traditional watch that fashionable people would want to buy. But it has already been done. The Withings Activité is a beautiful swiss timepiece with bluetooth and a step counter, made by a company that usually does fitness gadgets. If the NYT is right, Apple is planning to do something similar. Of course I could be wrong and the eventual “iWatch” will have everything from a touch screen and LTE to a QWERTY keyboard.6 Or it could turn out to be a ring or something else entirely. We’ll know more come September 9th.